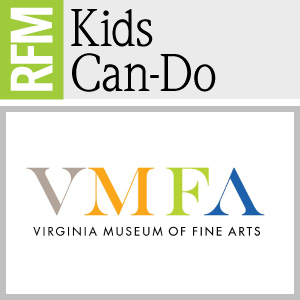 Many artists work with fabric as a means of creative expression. 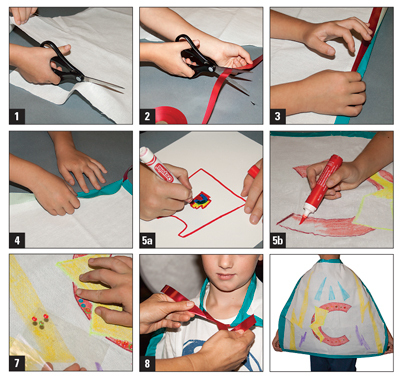 Use your powers of creativity to make a superhero cape and let your imagination soar! 1. Trim your fabric into a trapezoid with the help of an adult. Make sure your cape extends no lower than your knees. 2. Measure a length of ribbon long enough to loop around your head. 3. Place your ribbon along the small edge of the trapezoid. Press duct tape over the ribbon and fold the tape over the edge of the cape. 4. Continue to line the sides of your cape with colored duct tape, folding it over the edges. 5. Design a superhero symbol that can be your very own. Will yours reveal something about your super powers? Draw your superhero symbol on your cape with markers. 6. 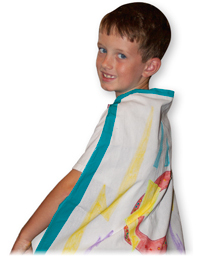 Decorate your cape with puff paint and markers. Experiment with patterns and symmetry to complete your design. 7. 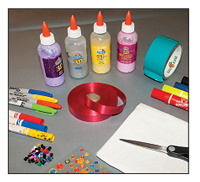 Add flair by gluing on fun embellishments, like sequins or buttons. 8. With the help of an adult, secure your cape by loosely tying the ribbon.